Barbeque Nation is a “live-grill” concept and now made a household name among barbeque enthusiasts across India. 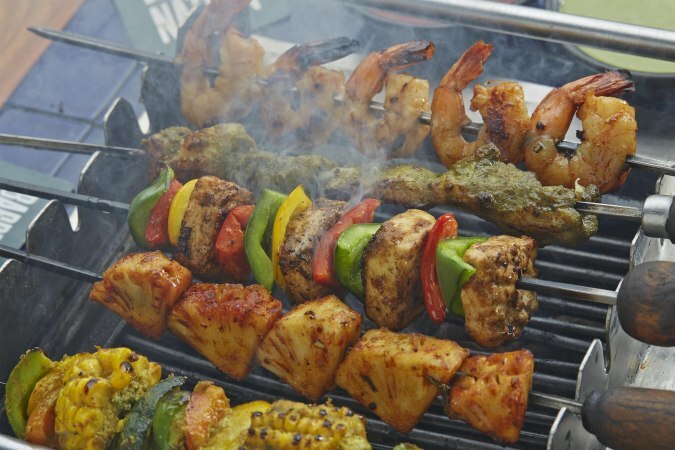 As well as a selection of fine food and fine drinks.Barbeque Nation is famous for its North Indian and Chinese cuisine. Buffet system and full bar is available. Barbeque Nation have Superb food , delicious buffet and friendly zone area. Opening hours are from 12 Noon to 3 PM and 6:30 PM to 11 PM. Rates are not very high 1300 for two people (approximately) , exclusive of applicable taxes and charges if any. A pint of beer cost around 150 each. Cash and Card payments are accepted. Barbeque Nation is a “live-grill” concept and now made a household name among barbeque enthusiasts across India. As well as a selection of fine food and fine drinks. The great Bear is a Microbrewery which is designed so beautifully. It has Indoor and Outdoor seating It is famous for its North Indian, Italian and Continental cuisine. Average cost is 1600/- for two people (approx) with alcohol,Exclusive of applicable GST taxes and charges, if any.Cash and Cards payments are accepted. Opening Hours are 12 Noon to 12 Midnight and Happy Hours are : Beer 12:00 pm – 06:00 pm, Domestic Liquor 12:00 pm – 07:30 pm. The great Bear have best pubs and bars, live sports screening, delicious food and full bar available also with free wifi. Burgril brings the best burgers in town! Juicy, ﬁnger licking & hygienic foods are available. We bet you will fall in love with this beautiful place. Average cost for two people is 500/- (approx. ), exclusive of applicable taxes and charges,if any. Cash and Card Payments are accepted. Opening hours from 12 Noon to 10 PM. Seating is not available, no alcohol and no smoking zone. Self service and home delivery is there. Brooklyn is a Stylish American dining room with a warehouse vibe and a menu of traditional comfort classics. This is famous for North Indian Cuisine. Average Cost for two people is 1600/-, Exclusive of applicable taxes and charges, if any. and Rs. 275 for a pint of beer (approx.). Cash and Card accepted. Opening hours 11 AM (Morning) to 12:00 PM (Midnight). Outdoor seating, full bar available with free wifi . Home delivery is also available. You can also order online. Pashtun Restaurant is Rustically decorated dining room with ethnic art and painted walls serving classic Pashtun dishes. Opening timing are 10:00 AM to 11:00 PM. Average cost for two is 500/-. This is famous for North Indian cuisine. No smoking zone with free wifi . It is a family restaurant. A place for small family parties. It is a place for vegetarian only with excellent food and on timing services are there. Sankalp is famous for its North Indian, south Indian & Chinese. Average Cost for two people is 600/- approximately, Exclusive of applicable taxes and charges, if any. Cash and Card Payments are accepted. Opening hours are 11 AM (Morning) to 11 PM. Available hall for birthday parties. Its chese corn dhosa is slso very famous. Dastaan is a place where you can do family get together. All good Ambience, Service, Presentation, Taste. Its north indian food is more famous than its south indian. Average cost for two people is approximately 1400, exclusive of applicable taxes and charges, if any. Cash and card payments are accepted. Opening hours are 11 AM (morning) to 11 PM. Live sports screening available with free wifi. Rooftop and Full bar is also there in Dastaan Restaurant. Beautifully designed Outdoor Section makes it unique. It is a refined dining room decorated beautifully and served dishes like Mangalorean, Chettinad, Malabari and Mughlai. The famous cuisines are North Indian, Mughlai, Chettinad ,Chinese , Mangalorean. Average Cost for two people is 1600/-, Exclusive of applicable taxes and charges, if any. Rs.145 for a pint of beer (approx.) Cash and cards are also accepted. Opening hours are 11 AM (Morning) to 12 Midnight. Facility of Free Home Delivery, Full Bar, Free Parking, Free Wifi. This place is family friendly and have late night delivery too. The Pirates Of Grill is a themed Restaurant with a lavish buffet, North Indian Food topped with some live music. Not only north indian , its south indian and chinese food is also very famous. Opening hours are Today 12 Noon to 4 PM, 6:30 PM to 11 PM. Average cost is Rs.1,200 for two people (approx. ), Exclusive of applicable taxes and charges, if any. No card payment,only cash. Full Bar Available, Live Music, Live Grill and Buffet System available. Live music make this place little unique. Sethi Dhaba is famous for its Desi Indian look. It serves the cuisines like North Indian, and Asian. The place is totally Vegetarian Friendly and Vegan Option too. It is decorated with some desi stuff like trucks jhulas & khaat. Sethi Dhaba is famous for its parantha, chai and punjabi music which attract people. It is on Delhi-Ambala Highway. This restaurant have features like car parking , indoor outdoor seating, takeout and wheelchair accessible. Opening hours are from 12:00 AM – 11:59 PM. THESE ARE THE RESTAURANT KNOWN FOR THE BEST NORTH INDIAN FOOD. North Indian Cuisine is associated with food from the North region of India. This cuisine has a rich tradition of many distinct and local ways of cooking. One is a special form of tandoori cooking that is now famous in other parts of India, UK, Canada, and in many parts of the world. Enjoy visiting these restaurants and please let us know if we are missing something. Like, Comment and Share.